The “Gateway” to the Kentucky Horse Park. 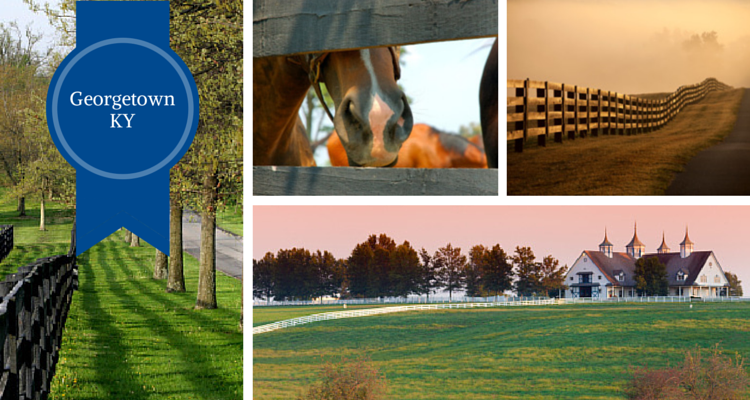 Miles of rolling Bluegrass hills dotted with thoroughbreds and farms. And only 30 minutes from Lexington. Consider what your life would look like in one of Kentucky’s most prized small town gems: Georgetown. What Does Georgetown Offer Its Residents? This small town certainly has made a big name for itself, and for good reason. After you read through all of its accolades and reasons why visitors love to come to Georgetown, you arrive at the many reasons people also prefer putting down roots here. Only 13 miles and about 30 minutes away from Lexington, Georgetown is the perfect place to find more land, larger square footage and more importantly to have nature at your doorstep. Horse farms abound surrounding the quaint downtown strip filled with shopping, dining and entertainment. If you are looking for a slower pace of life only minutes from the amenities of Lexington, then Georgetown is right for you. Georgetown is known for its historical homes in the classical Southern style with large columns and front porches. Georgetown’s classical style emanates throughout the area as it is filled with estates lined by stately columns and porches built to absorb the panoramic views of bluegrass fields. There are homes anywhere from around $200,000 to $1M+. The newer neighborhoods such as Mallard Point, Cherry Blossom Village and Victoria Estates have homes in more contemporary styles, but the town is more known for its horse farms and downtown historic homes. Outside of these areas though there is ample space to build, find new construction or purchase a beautiful estate equipped for housing and training horses. There are also ample opportunities to enjoy Georgetown’s parks and trails such as the Elkhorn Creek trail system, not to mention the miles of scenic backroads. Fishing, canoeing, hiking, biking and walking around the area’s trails area only a few of the basic activities Georgetown and its surrounding areas provide. The key to living the Georgetown lifestyle is a want and a need to be closer to rural Kentucky. This town is close to the land and to the horses that have made this state so renowned. Residents are proud of their homes and land, along with the dedication to historically southern traditions. If you are ready to find a home with more space for your family and potentially your horses, then Georgetown may be just the right fit. Searching for homes and land in Georgetown is easy with our simple online tools. We have new homes and estates for sale all the time and by using our filters and search tools you can narrow down your search easily. When you visit the site type in Georgetown, your neighborhood of choice or even a street and available homes will appear. Don’t see what you want? Use the filters to narrow down properties by “Horse Property” or “Historic Property” for example. For more help with your Georgetown property search, please don’t hesitate to contact us! Questions About Your Search? Ask Away!